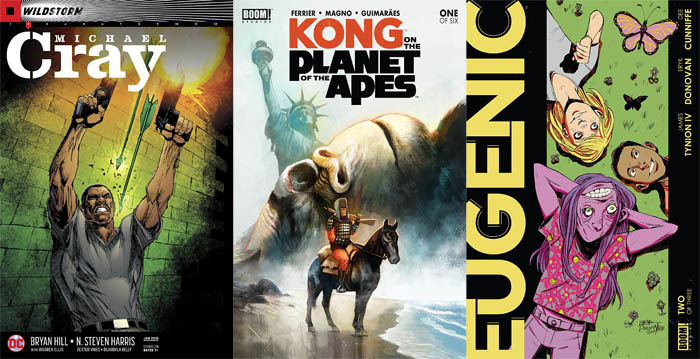 Home »Comics»Deadshirt is Reading: Michael Cray, Kong, and Eugenic! The first spinoff of the new Warren Ellis-spearheaded Wildstorm Universe continues as the series’ general mission unveils itself: this is the book where Deathblow murders the living hell out of cynical versions of DCU heroes. And, you know, that’s a pretty damn fun concept for this book and for furthering Cray’s story and giving him time outside of the increasingly busy main title. Ellis’s reinvention of Cray as an assassin who only kills when he deems it morally just basically turns this series into an Assassin’s Creed where all of the villains are evil civilian identities of the Justice League, like from a weird DC version of Ellis’s previous Ruins. It’s a fun premise. However, it’s the execution that makes it work, and Hill, Harris and Vines create a pretty damn fun comic about a dude systematically hunting down and killing an evil Green Arrow who hunts people down on a private island. This is, as far as I can tell, Hill’s first Big Two work, although he spent a lot of time at Top Cow before starting the current Image title Postal; N. Steven Harris is otherwise best known as the artist of the Grant Morrison and Mark Millar-written Aztek: The Ultimate Man title for DC in the ‘90s, while Dexter Vines is unquestionably one of the best inkers in the business, with a clear, distinctive line and an incredible history of collaboration with artists like Ed McGuinness and Steve McNiven who, frankly, hasn’t been the same since he switched to being inked by John Dell and Mark Morales. I’m not at all familiar with Kelly, and this appears to be her fourth credited work in comics, but she does a pretty solid if unremarkable job—nothing made me say “wow,” but the storytelling was always clear, and it’s often underestimated how high the “clear storytelling” bar can be. It’s a motley crew of a team, and the kind of weird match-up I was hoping for when they announced the return of the Wildstorm imprint as an Ellis-managed pop-up in the style of Gerard Way’s Young Animal. I never read a lot of Deathblow comics, so I don’t have much of a frame of reference for the character’s history, but this is a fun, exciting title with a revitalized, new-to-me character, a unique hook, a fun cast, talented creators and a whole lot of well-calculated murder. We’re only two issues in, but I’m excited to see where this book goes, and what it means in the grand puzzle that Ellis is building with the universe. Up front, Kong on the Planet of the Apes is definitely a “two things t-shirt” comic, and there’s nothing groundbreaking in here to curb the eyerolling that typically accompanies this type of media. That’s not to say it’s bad, though. In a touch I found novel, the story is set not only in the universe of the original Planet of the Apes movies, but directly following the first. The setting is probably the most important part of this book because so much of the writing and art is dedicated to replicating the feel of the world. The writing is similarly chained to the original Planet of the Apes, from the style of speech to the character voices. However, Ferrier manages to avoid the clashing that plagues the art thanks to the portability of the Kongcept Kong concept. Apes find out about Skull Island and go there, and there’s a big gorilla and some pesky dinosaurs. Easy to slide into the existing world. If this series has anything to say, or any excitement to bestow, it will have to come in future issues, because this one is all about showing you exactly how many times the creative team watched the Planet of the Apes. I’ve been counting the days until Eugenic #2’s release ever since my breathlessly positive assessment of the first issue. While the second issue doesn’t quite reach the heights I anticipated, it’s still a worthwhile comic and makes me look forward to the conclusion. Two hundred years after the first issue, society has been separated into the numans – the mutated humans from the first issue, who now run the world, and the small percentage of humans were were immune to the deformities. Even though the deformities were supposed to get rid of divisions, they’ve created a tiered society where the numans rule and diversity in the humans is seen as a weakness. The numans keep the humans in pariah cities (this one takes place in Future Pittsburgh) and on their 21st birthdays, humans are administered tests to figure out how they’ll fit into their seemingly utopic society. If you’ve read any amount of sci-fi, you can predict it’s not quite as it seems—but it’s worse in a way that’s far different than you imagine. The story follows a woman named Bekk on her test day and shows everything that happens when she takes some power into her own hands. Tynion and Donovan do a fantastic job showing diversity of all kinds even with a comparatively small human cast. One of the most affecting bits is when Bekk comes home to her roommate, Kitty—a lesbian in a wheelchair and both of those parts are important. She was kept in the wheelchair and sent back to the city because they had no use for her, and since the numans have no sexual preference, they have removed all books from the libraries that play up differences and divisions. As such, Kitty has “read every damn book in that library” and looks for any evidence of “more girls who liked girls how I like girls,” only finding small inferences or projecting her own hopes onto the page. It’s a short scene but it stands out to demonstrate what kind of society they live in and how trying to get rid of differences has hurt people like her. There’s more action in this issue than the previous one and much less dialogue. There’s few to no outright splash pages, but there’s several times when the action goes faster than the conversations. The art is clean, clear, and conveys all the necessary info. This issue, until maybe the end, is pure sci-fi. There’s some body horror in the last few pages, but it’s nowhere near as grotesque as the first issue. 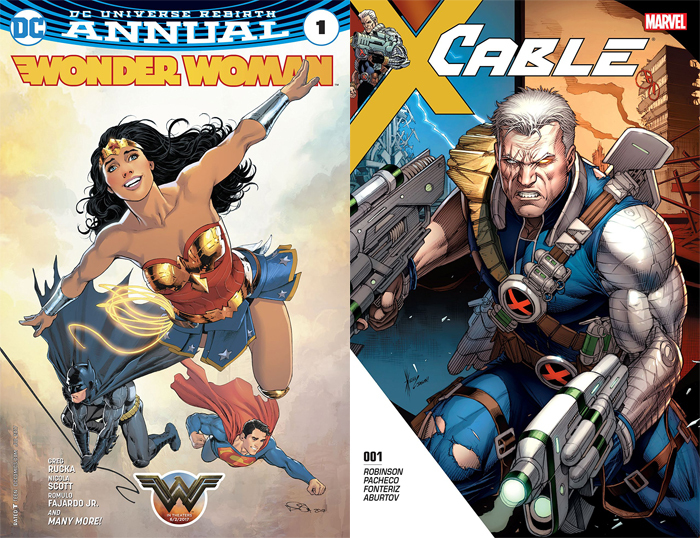 Though I appreciate how each of these comics are self contained stories, part of me wishes there were one or two more issues per era, or at least wishes the issues themselves were jumbo-sized. Though all of the characters are well written and distinct, it feels like another issue would have allowed us to get more invested in their outcomes. Eugenic #2 ends with a new beginning for the series – one that we will see the two century-long results of in Eugenic #3. It’s a chilling look at a world with no differences, except all the differences. While not as strong as issue #1—sometimes it moves too quickly, and it’s not quite as deep—it’s still a solid comic that’s absolutely worth your time.